If you are anything like me, you have days when you just need an emotional or spiritual boost. It’s not that there is anything wrong with life, but you just seem to get bogged down with…life. Changing diapers, doing dishes, running errands, work, callings and the list goes on. Sometimes you have the energy for it all and some days you just don’t. That’s when you need a little extra boost. When I am in school it seriously seems like I need one of those boosts nearly every other day. “Our women are not incredible because they have managed to avoid the difficulties of life – quite the opposite. They are incredible because of the way they face the trials of life. Despite the challenges and tests life has to offer – from marriage or lack of marriage, children’s choices, poor health, lack of opportunities, and many other problems – they remain remarkably strong and immovable and true to the faith. Our sisters throughout the Church consistently ‘succor the weak, lift up the hands which hang down, and strengthen the feeble knees””. I watched a video last night that just happens to go along perfectly with this quote. The video is called “Is your To-Do list bringing you down?”. I am someone who always has a to-do list scribbled onto a note card, put in my phone or sometimes even texted to myself. I get super stressed if I don’t finish everything on my list, but that video was such a good reminder that sometimes it isn’t always about everything on the list. Sometimes the most important thing is serving others and making a difference for them. I have felt so comforted (when I get to the end of a day and still have half of my to-do list) to stop and think about who I connected with that day, and realizing that maybe I did more than I initially thought I did. Recipe time. This rice bowl is a super quick meal, and it tastes delicious! I made it as a basic Asian vegetable rice bowl, but you can add meat or extra veggies and it tastes just as wonderful! You can whip this up in about 15 minutes so it is perfect for a busy weeknight. 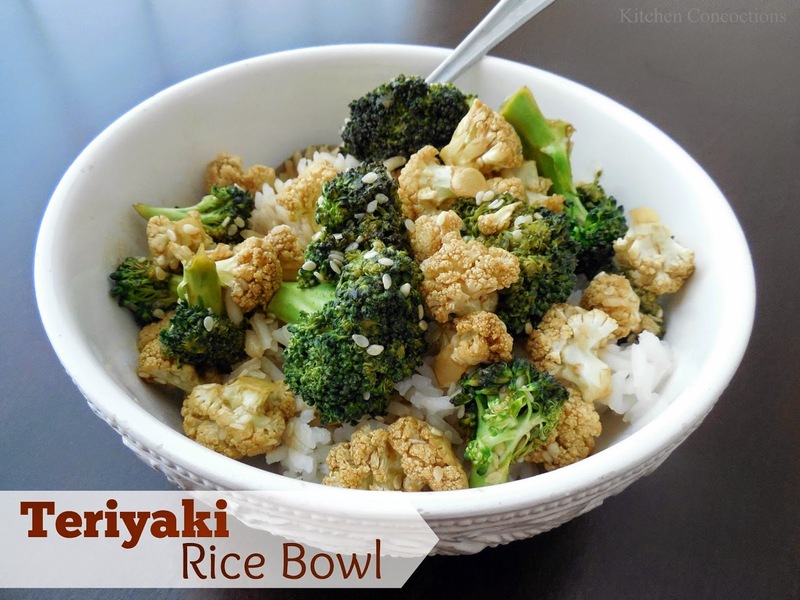 This is also my absolute favorite way to eat broccoli and cauliflower! They pick up the teriyaki flavor perfectly, and because this is made like a stir-fry, they don’t get the bitter flavor that boiling usually brings. You have to give this a try! When I want to do more than just broccoli and cauliflower, I usually add chicken, snow peas, summer squash, zucchini, carrots, cabbage, etc. Combine the soy sauce, pineapple juice, brown sugar, garlic, ginger and sesame seeds in a wok or frying pan, over medium-high heat. Stir the sauce until the sugar is dissolved and the wok is hot. If you are adding meat to the saute, you would put it in the wok here, and cook it completely before adding the vegetables. Add the broccoli and cauliflower (and/or other vegetables you choose) and saute until the broccoli is bright green (about 5 minutes). Serve the sauteed vegetables over the rice.